There are lots of ways to describe this smart sale find. Summery. Classic. Vaguely French, in a kind of stereotypical, but completely wonderful way. This pima cotton sweater is available in vanilla with charcoal grey stripes and a dusty grey-blue shade called blue haze, also with charcoal grey stripes. Wear it with skinny jeans and ballet flats for an Audrey Hepburn vibe. Pair it with shorts and sandals for a laid back So Cal look. Both color options are currently on sale for 50% off. 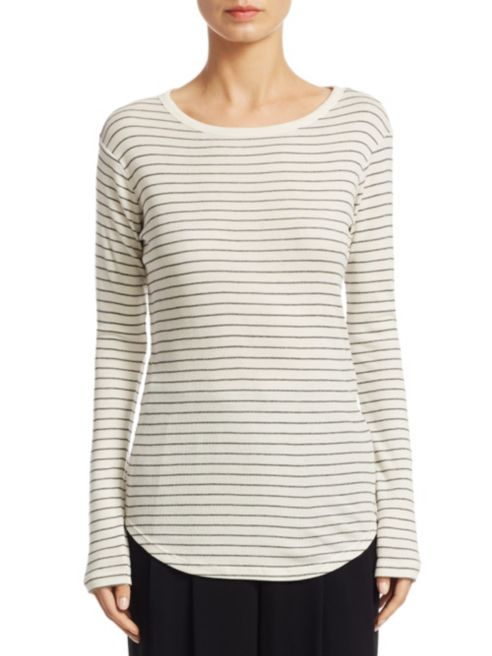 → Buy the Vince Pinstripe Shirttail Cotton Sweater, $54.99 (was $110.00), at saksoff5th.com.